Senator Leila de Lima spoke to ANC Headstart host Karen Davila on Tuesday and said she was really impressed with President Duterte's SONA. The lady senator said the State of the Nation Address was impressive since the President knows his real audience, the people, and he knows exactly what they would want to hear and he also knows how to stir emotions. De Lima said the best line of the speech was when Duterte said, "I assure you, this will be a clean government." However, the former justice secretary pointed out that "it's an oxymoron for one to say that human rights can be used to destroy peace and order." "Human rights and public order are mutually exclusive. If we have to choose between the two, human rights should not be sacrificed," she said. While the 91% trust approval means majority approve of the administrations fight against illegal drugs, she said it doesn't mean everyone agrees with the method. "I don't think human rights should be sacrificed in the campaign vs illegal drugs," said de Lima, who is expected to head the Senate Committee on Justice and Human Rights. The senator clarified that she is not derailing nor blocking the campaign versus illegal drugs. 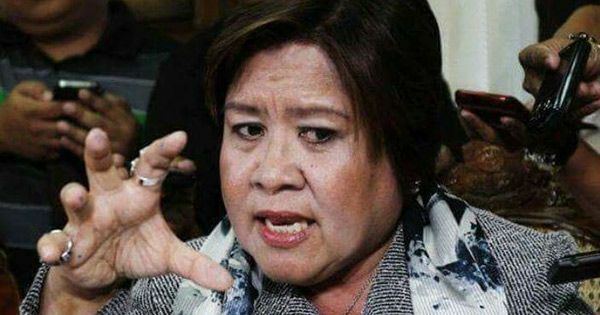 Once the senate inquiry on the series of killings of drug suspects, she said the committee would start with specific cases which they think are full of circumstances that will make it a case of summary execution. As to why the President did not mention the death penalty and the lowering of age for criminal liability, de Lima said the non-mention may have been deliberate because those two are contentious issues. The lawmaker insisted that she is against death penalty and not in favor of lowering age of criminal liability. De Lima also denied any link to convicted drug lords saying it is part of black propaganda. "There is no such party where I sang with Herbert Colangco," she said, referring to the Bilibid inmate who received an award as new male recording artist and held a concert in his own studio inside the national penitentiary. "The photo (that went viral online) was doctored. It's part of a demolition job against me," she said. De Lima said she believes that those behind the demolition job want to dampen her resolve to conduct a senate inquiry. She said, "I am trying to find out who is behind the demolition job against me. These may be people around the president." Duterte shook her hand on his way to the rostrum at the House of Representatives. Surprised of the President's "warm, friendly gesture," de Lima said she could only say "Hi Sir." "I appreciate it. It was an ice breaker of sorts," she said. "The handshake showed that we do not take things personally."